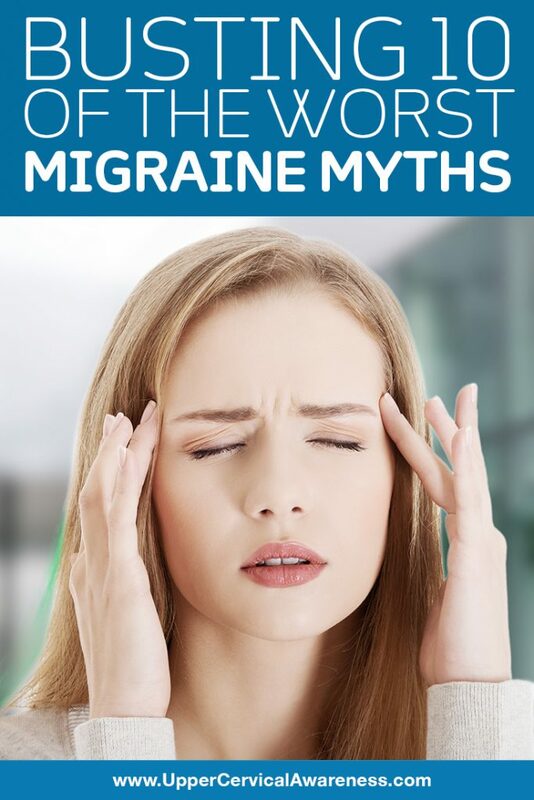 Despite the fact that about 12% of adults experience migraines, there is a shocking amount of misinformation available on the Internet and being passed around by word of mouth. We’re going to look at 10 of the worst migraine myths, so you can get a better grasp of what this condition is and how to find real hope for relief. Migraines are a neurological condition. That puts migraines in the same category as diseases like multiple sclerosis and fibromyalgia. A headache is one symptom of a migraine, and it does not have to occur with each attack. In fact, only 85-90% of migraines occur with a headache at all. There are plenty of other things that can cause headaches besides migraines. Something as simple as eating your ice cream too fast can result in a headache. But you won’t suffer from the other symptoms of a migraine such as sensory sensitivity or neck pain during an ice cream headache. While some migraine triggers are avoidable (like eating something you have a food sensitivity to), most of them are unavoidable. You can’t control the weather or stop someone on the bus from wearing strong perfume or live a completely stress-free life. Conversely, you may find that more medication will cause migraines to get out of control. Most prescription and over-the-counter drugs that people take for migraines can actually cause headaches if they are taken too often. Always read the directions for use on any medication you purchase to ensure you are not taking it too frequently or exceeding the maximum dosage. If you have a prescription, take it as directed by the doctor, and call right away if you notice any of the side effects. While this one is not 100% wrong, it isn’t 100% right either. Caffeine can trigger migraines both if you have too much or if you have developed a dependency and have too little. Plus, caffeine temporarily enhances blood flow. If your migraine is related to blood flow to the brain being inhibited (as many cases are), then you may see some benefits from caffeine in moderation. You can reduce the frequency of attacks by avoiding things you are allergic to or have a sensitivity to. And a nutritious diet is never bad for your health. However, there is no secret diet that acts as a cure-all for migraines. First of all, you should never start on a new supplement without consulting your physician. You don’t know what interactions it may have with your medications. Additionally, the supplement industry is rather loosely regulated, so you need to be sure of what you are taking. At best, you may be taking expensive supplements that do nothing. At worst, you may have a reaction to the supplement that is even worse than the migraines you are dealing with. Only about 20-25% of migraineurs experience aura. This phase of a migraine usually occurs within an hour of the headache phase. Symptoms are primarily visual in nature. Migraine with aura also makes a patient more prone to depression, so doctors should keep an eye on this. I know we just said that more medicine isn’t the answer, but sometimes a little medicine is necessary. You can’t go through life in constant pain. Sometimes you need medication to help you take care of what you need to when your migraines decide to strike at the worst possible moment. It is more a matter of determining what works best for you. The caution is against medication overuse. While this is possible, it is highly unlikely. Neck pain is a symptom for about three-quarters of migraines patients. That is no coincidence. A misalignment in the upper cervical spine can affect blood flow to the brain, brainstem function, and lead to intracranial pressure if the proper drainage of cerebrospinal fluid is affected. If you suffer from migraines, especially if you have a history of head or neck injuries, you may particularly benefit from upper cervical chiropractic care. This is a safe and gentle form of chiropractic that focuses on the top two bones in the neck. These two bones, known as the atlas and axis, are the most likely to affect the brainstem, blood flow, and cerebrospinal fluid drainage. Upper cervical care involves very precise measurements of the C1 and C2 (atlas and axis) so that low force corrections can be administered. These long-lasting adjustments give the body the time it needs to heal. As a result, many patients in case studies have seen the frequency and severity of their migraines reduce with care. Others have found complete resolution. If you are looking for natural help in dealing with migraines, upper cervical chiropractic care may be right for you. Schedule a consultation with a practitioner in your area to learn more, and you may just find yourself on the path to better overall health and well-being.